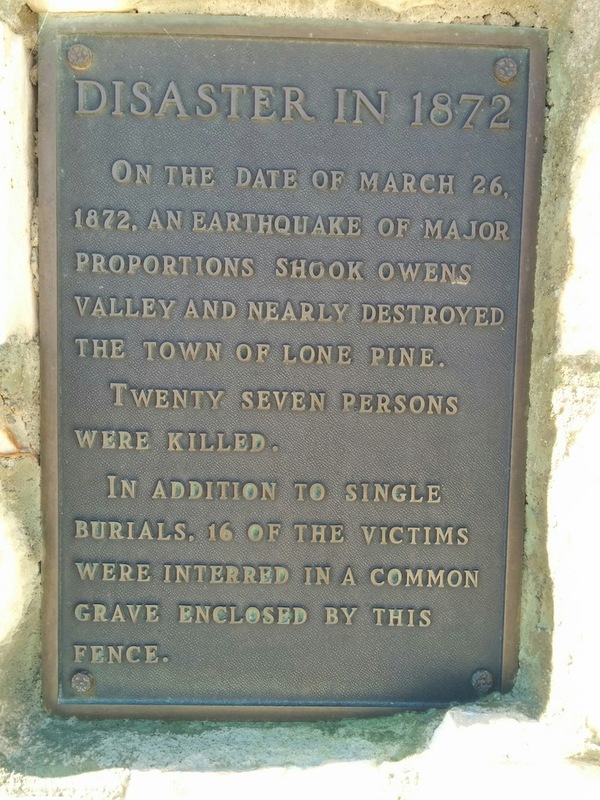 As you drive south into Lone Pine there is a roadside sign marking the spot where the mass grave for 16 of the victims of the March 26, 1872 earthquake were put to rest. It is an official California Historical Landmark so we decided to stop, take a look and pay our respects. Since we were heading north we made a u-turn at Pangborne Lane, pulled off to the side of the road and walked up the little sand hill with wood slats to help with traction. 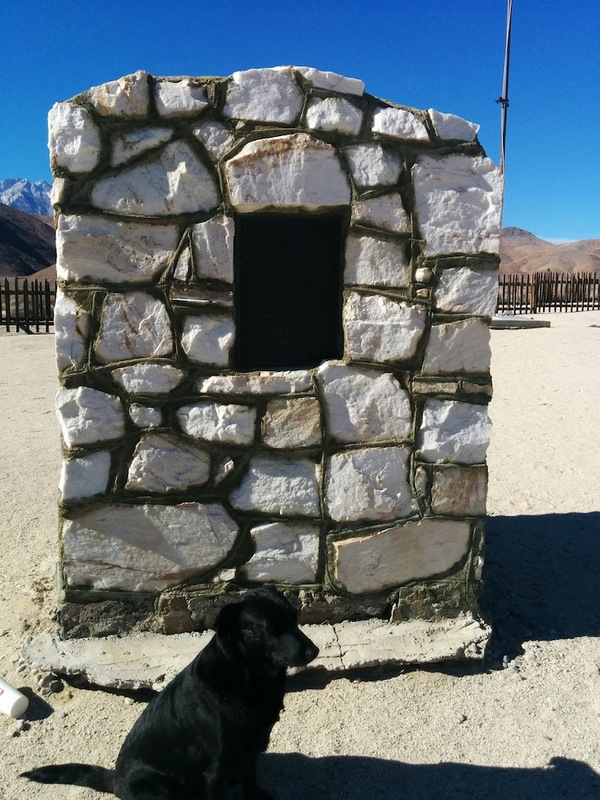 We are greeted by a built stone monument with a plaque explaining the history and reason for this site. Someone apparently thought this would be an appropriate place to have their Carl’s Jr. garbage lunch and leave the trash behind. As usual we leave places we visit cleaner than how we found them and so pick it up to dispose of it properly at a later time. 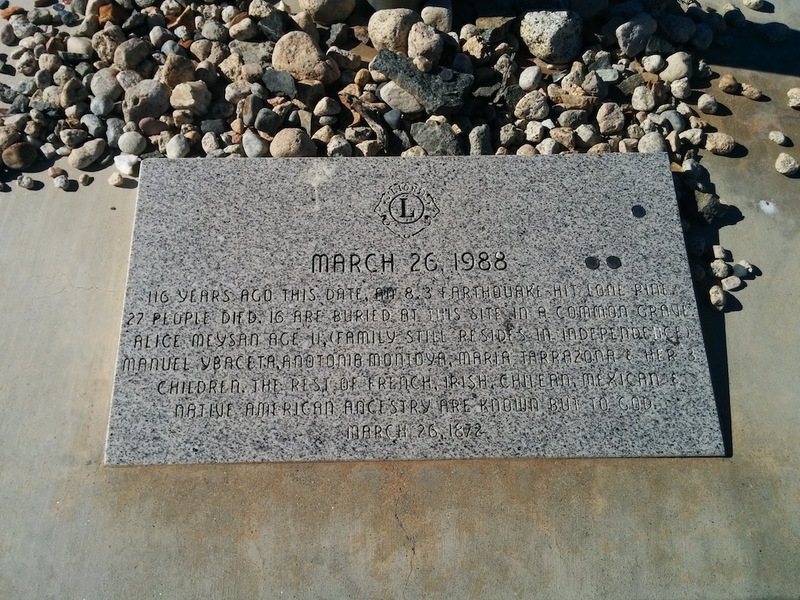 All of 10 meters past this first monument is a flagpole and a second plaque placed by the Lions organization in 1988 right at where the iron fence surrounding the actual mass grave site is. We take a few minutes to pay our respects to the nameless group interred here and think about the awesome power under our feet waiting to be unleashed again some day. Back at the Tacoma we take a u-turn and continue north on our way back up towards Humboldt County.